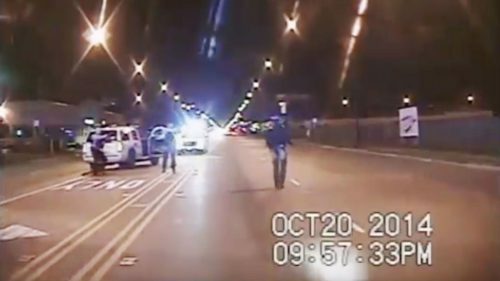 With everything else happening, many may not have noticed a very consequential jury verdict in the 2014 shooting of 17-year-old Laquan McDonald by Chicago PD Officer Jason Van Dyke. On Friday, Mr. Van Dyke was found guilty by the jury of second degree murder, and he was also convicted of 16 counts of aggravated battery with a firearm —one for each bullet that struck the teenager. This was a major verdict – no Chicago police officer had been convicted of murder in an on-duty shooting in nearly 50 years. And it was perhaps the biggest jury verdict of the post-Ferguson era. The dashcam video from a police car was critical. It took the city 13 months to release the video, and only after the judge ordered it, following the records request by a journalist. First, California just passed AB 748, authored by Assemblymember Phil Ting. That allows the public to access police body camera footage and other recordings that capture incidents involving officer use of force. Remember when Davis passed its body camera ordinance, there was no provision for public disclosure – but that was going to change under recommendations from the interim police auditor. Why is this so important? It was a records request for the video, turned over to the public 13 months later, that forced the prosecutors to file criminal charges against Mr. Van Dyke. That leads me to the second thought – video matters. We have been fighting the fight for body worn cameras and many have wondered if it really makes a difference. This suggests it does. For one thing, video can give us a neutral account of what took place. That turned out to be critical because Officer Van Dyke’s testimony was so widely disparate from the video. When Officer Jason Van Dyke testified, he asked the jurors to trust his memory rather than the video. The jurors chose the video. The only African American juror on the panel told the media Friday that the officer “messed up” by testifying and she did not find him credible. Nor did her fellow jurors. Other jurors found the testimony to be “rehearsed.” The jurors watched that video dozens of times. Several said they were bothered by the inconsistencies between his initial statements and what the video showed. Video matters. It may not always result in a conviction when the officer can more credibly claim to have feared for his life. But in this case, that assertion was not backed by the testimony of other officers. Finally, there is this – the trust factor that police have had is wearing down. One of the reasons that California tried to change the rules in use of force incidents is that it is hard to convict police officers of charges of fatal shootings when carrying out their official duties. The law gives the police wide latitude to use deadly force. Most often, the critical element is an officer’s testimony, which is seen to carry great weight with jurors. But twice this year we have seen officers convicted of murder, despite testifying. The Times writes that “after the Chicago jurors described Friday how they discounted Officer Van Dyke’s words, some legal experts suggested defense lawyers in future cases might reconsider their tactics. A key factor here was that other officers did not back his account. No other officers at the scene that night found it necessary to pull their weapon. Mr. Van Dyke arrived ready to shoot to kill and found the reason to do so. He is actually fortunate that the jury believed he had lawful intentions, or it would have been murder one with an automatic life sentence. Is this an exceptional case or does it show that jurors are shifting their views? What’s remarkable here is that the defense managed to exclude all but one black juror and the verdict was still not close. Some will continue to view this as angry and anti-cop folks against law and order and safety. I see it differently – trust comes with holding those who make grievous errors accountable, and that is what we see here. A jury with no axe to grind has rendered a profound verdict and held at least one police officer accountable for his mistakes.